Your Source For Ski Resort Deals. Ski vacation packages to Maine. Take advantage of our deals, discounts, the best planning advice, or create your own ski / snowboard package. Sugarloaf, Maine's largest ski resort, is perfectly nestled in the state's second highest peak. Its 1,400 skiable acres boundary to boundary has 138 marked trails and 651 acres of developed trails. The 2,820 feet continuous vertical drop, which is considered the longest in New England, has ever since attracted both the local and international skiers. 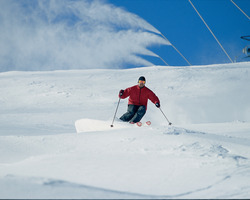 This increasing skier and rider visits each year has then made Sugarloaf among the popular and high rated resorts in the state. With the 15 chairlifts that serves as every skier's gateway to world class trails and glades, guests are then provided with endless opportunities for winter fun and adventure. Sunday River features 131 trails spread across eight interconnected mountain peaks, each offering a distinct experience. Sunday River has the most advanced snowmaking system in the East offering enthusiasts never-ending challenging fun.